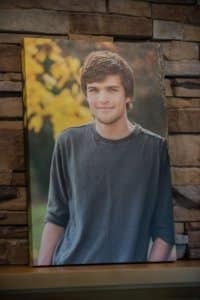 Say what you will about online photo sharing, there’s just NO SUBSTITUTE for a professionally printed photograph, especially when we’re talking about high school senior and family portraits! Especially those big beautiful pieces of art that you can touch and feel and display on your wall! Here’s a snapshot of a 16″x 24″ canvas that I delivered to one of my high school senior portrait clients this evening. If you’re looking to hang art in your home, 16 x 24s are almost always a great choice. It’s the perfect size—not too big, and not too small—so it looks great over a couch in almost any home! And, 16x24s have the same dimensions as most modern digital camera sensors, so frequently the image doesn’t even need to be cropped and you get to enjoy the photograph just as it was originally taken. If you’re looking for more info about choosing artwork for your home, click here to ask about my wall display guides. And, if you need some great portraits of your high school senior or family, click here to get in touch!